Everyone has one chore that they hate doing. Mine is the laundry. First of all, there's never any sense of completion. You are never done with the laundry. 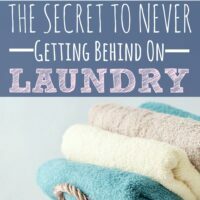 You'll have dirty laundry in your house for the rest of your life. It's a bit depressing. By following Flylady for a few years, I started feeling a lot better about doing the laundry. She made it easy, just one load a day. 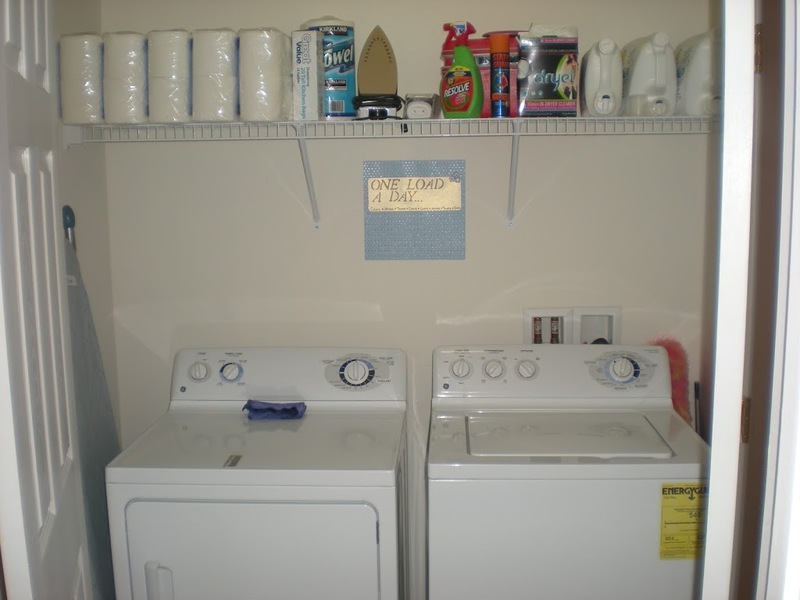 Put a load in when you wake up, switch it when you get home and put the load from the dryer away. 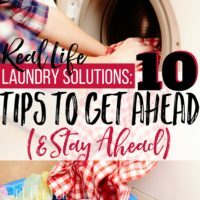 Since your doing one load every day, your loads are much smaller than what your used to now, so it only takes a few minutes to put the clothes away. 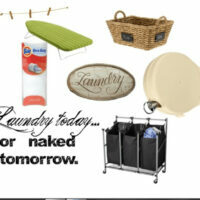 Even though I've gotten used to doing laundry every day, it's still not my favorite chore. One of my tricks for doing things that I don't like is to try to make it easier. If I have a really clean, organized laundry room then every time I open the doors, I feel in control and proud of what I've accomplished. It makes doing the laundry much easier because I get that “I Rock!” feeling as a reward. I use this in other areas of my life- I always dress up and take extra care with my make up and hair when I have to do something that I hate. It makes me feel better. The only thing I keep on the actual machines is a purple Flylady cloth that I use to wipe the top of the machines down every few days. It takes about 2 seconds. 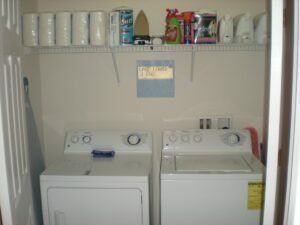 Flylady suggests putting a picture of your family in your laundry room, to remind you of why you do laundry. I haven't gotten to that point yet, but I do have a reminder sign that I only need to do one load a day. It also lists the order of loads that I do (darks, whites, towels, darks). I keep a small stockroom for the laundry room and the upstairs guest bathroom on the top shelf. It holds extra toilet paper, paper towels, garbage bags, an iron, Resolve stain remover, static guard spray, Dryel kit, and laundry detergent. I keep the laundry detergent directly over the washer so that I can just hit the button, count to 5 and release the button. I don't have to measure, or even lift bottles. 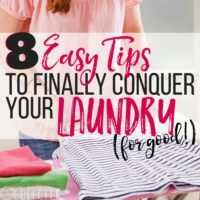 I use a four bag laundry sorter that I bought from Target years ago. Surprisingly, they still sell it, you can find it here for $34.99. I stuck post it notes to the wall above each bag identifying what goes in it. Left side is whites, the two middle bags are for darks, the right side is for towels. I always keep a basket in the closet for lost socks, Once I've put the laundry away, any extra socks get tossed in the basket, every week or so, I'll dump out the lost sock basket and start pairing them up. I use the lost sock basket as an emergency landing point for clean laundry. There have been a couple of days where something unexpected happens and I don't even have the 5 minutes it takes to put the laundry away. When I'm sick, I can (or convince Jon to) just switch the laundry out and toss the clean clothes in the sock basket. When I'm better, I can put all of the laundry away at once. A few sprays of water before you hang them will take most of the wrinkles out.